in the bottom of your third tub of “Chocolate Therapy” ice cream. You think you’ll never find anyone as good as he was, e-ver. But what if… he did you a favor? 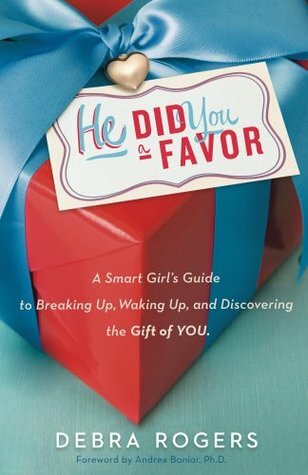 He Did You a Favor is an empowering, humorous, hands-on guide with straight talk and advice to help you break away from Mr. So Very Wrong and break through to the life you desire. This Queen of Breakovers is your best-girlfriend expert in the school of love. is your best girl expert in the school of love. With years of dating and breakup experience, including one crushing breakup at eight months pregnant (which evolved into a supportive divorce and loving friendship), Debra's earned her relationship MBA. She's been there, done that, got the t-shirt. Experience is knowledge. Knowledge is power. She's here to pass the girl power onto you. Before He Did You a Favor, Debra worked the studio circuit for years as a script analyst and Development Associate for both film and television. Her passion for story was further expanded as a writing consultant for numerous motion picture and television writers through her company Your Best Writing Now. Debra's coaching has been described as: "powerful," "insightful," "inspiring," "generous," and "a rare gift." She also built a successful voiceover career, voicing strong, powerful women in film and television from "Streetfighter" to "Xena: Warrior Princess." Through her life experience, she discovered her own inner warrior and found that the strong heroines she'd been voicing were also within her. Soon after this discovery, friends, sisters and mothers began to approach her, asking how they could do it too. She listened to other women's stories of breakup and heartache. That's when she knew she had to write this book, to help others who were trudging through dark emotional waters, not knowing how to find the shore. Debra currently lives in the Los Angeles area with her amazing daughter and has finally found true love. HE DID YOU A FAVOR is her recipe for success - so you can have the life and the relationships you've always dreamed of. If you are a woman who has recently ended a relationship then this is the book for you. I could have used this one a few years back when I was going through a very nasty divorce. This book will show you that you are still worth something, don't blame yourself, and that you have nothing wrong with you. It is a great self-help book and story. "*I received a copy of this book for free to review, this in no way influenced my review, all opinions are 100% honest and my own."